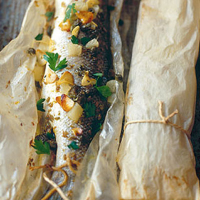 When wrapped tightly in a soaked paper parcel, the sea bass will cook in its own steam. Serve it with some steamed vegetables and baby potatoes. Preheat the oven to 220°C/gas 7. Grate the zest from the lemon into a pestle and mortar, add the fennel seeds and 2 tbsp olive oil. Season and pound to make a rub. Place each fish near the front of a large, double-thickness sheet of greaseproof paper. Smother each fish inside and out with the rub; drizzle with ½ tsp olive oil. Fold the paper over the fish to enclose, then fold the sides over the ends. Roll the fish up to form a parcel. Tie with string, then soak under the tap. Cook in the top half of the oven for 15 minutes. Cut off the lemon pith and discard; cut the flesh into ½cm cubes. Unwrap the fish onto a dish; scatter with the parsley. Heat the remaining olive oil in a frying pan on a high heat; fry the capers and garlic until crisp. Stir in the lemon and pour over the fish. White burgundy will echo the lemon here.